NOIDA, India – April 11, 2018 – PRLog — TI Infotech, a Premier Travel Technology Company in the industry of travel technology solution providers is geared up; to participate in the 25th Arabian Travel Market which is going to be held from 22nd to 25th, April 2018 at Dubai World Trade Centre. 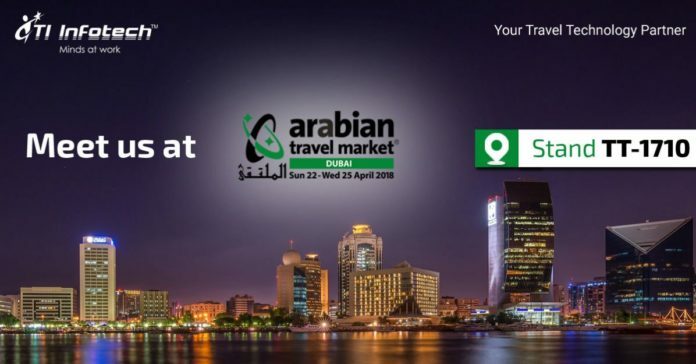 Arabian Travel Market, Dubai – The world being becoming more economically stronger as the days pass has in the due course fueled up the tourism industry. Tourism industry is the industry which is at its peak this time and so has eventfully provided travel companies with a golden opportunity to earn more than usual and serve people benevolently and presenting them the finest places on earth more graciously. The brand ATM Dubai has a firm place in the calendar of everyone who loves travel professionally & personally. “TI Infotech team is looking forward to welcoming you for the unique opportunity to network & discuss your technology requirements at Stand TT-1710 inSheikh Saeed Hall 1 from 22nd to 25th April 2018 at ATM, Dubai“, said Ms. Meenu Sachdeva, Co-Founder & Managing Director of TI Infotech. TI Infotech is a CMMi Level 3 appraised company & follows “A Total Solution Approach” in providing Travel Technology Solutions. The company has won ‘Best Travel Technology Provider’ (http://www.tiinfotech.com/) awards in 2017, 2016 & 2015 (three Consecutive years). The company is promoted by a dynamic team of techno-functional consultants with extensive experience in providing technology solutions to the Travel and Tourism Industry. Travel Cloud Suite: It’s a real-time web based booking engine with transaction capability, real time inventory with instant pricing, booking status & confirmation online. Travel Assist: Which is a Comprehensive Tour Management Software that enables an organization to efficiently manage the complete tour cycle.